and other Web Company Come-Ons? Are You Annoyed With the Attitude and Language of the "Computer GEEKS"? Quotes of $600 - $6,000 + for a Web Site?? You Do Have a Friend in the Business. Wellll... OK, maybe I do know a few things about computers. 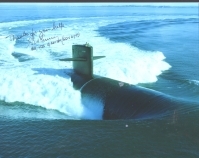 I spent six years during the Cold War fixing both computer hardware and software as a Spook Rider on Nuclear Powered Fast Attack Submarines. I was an award winning Field Service Engineer for Digital Equipment Corporation when they were second only to Big Blue (no it was not my leaving that doomed the company to dwindling until being taken over by Compaq). I was even on the Internet before Al Gore invented it (see article below). But most important to YOU, the person looking to promote their business using the World Wide Web, is that I have spent the last two decades helping to build many small businesses with all kinds of advertising and marketing . Web Sites, Direct & E-Mail Marketing, Signs, Trade Shows, Yellow Pages, Newsprint, Radio, TV, and a variety of other unique promotional ideas. Many of my clients had already tried to put their business online trusting some computer whiz kid, only to discover that they had a really neat (and many times a very expensive) toy with all kinds of bells and whistles, but nobody knew where it was or how to play with it. A definite ego stroke, but not very profitable. I will work with you to help design a marketing plan and strategy for your business that will work on the STREET and on the INFORMATION SUPER HIGHWAY! Wayyyy back in 1990 I had my home office computer linked to Cornell University via CENET (Co-Operative Extension NETwork). This was one of the many University and Military INTRAnets that ultimately became linked to form the INTERnet. Paul W. Hartnagel, owner of CALL PAUL is on the cutting edge of tree and turf care in more ways than one. Not only does his service offer periodic tree and lawn cutting but he is also periodically logged on to the Mainframe Computer of Cornell University via CENET. 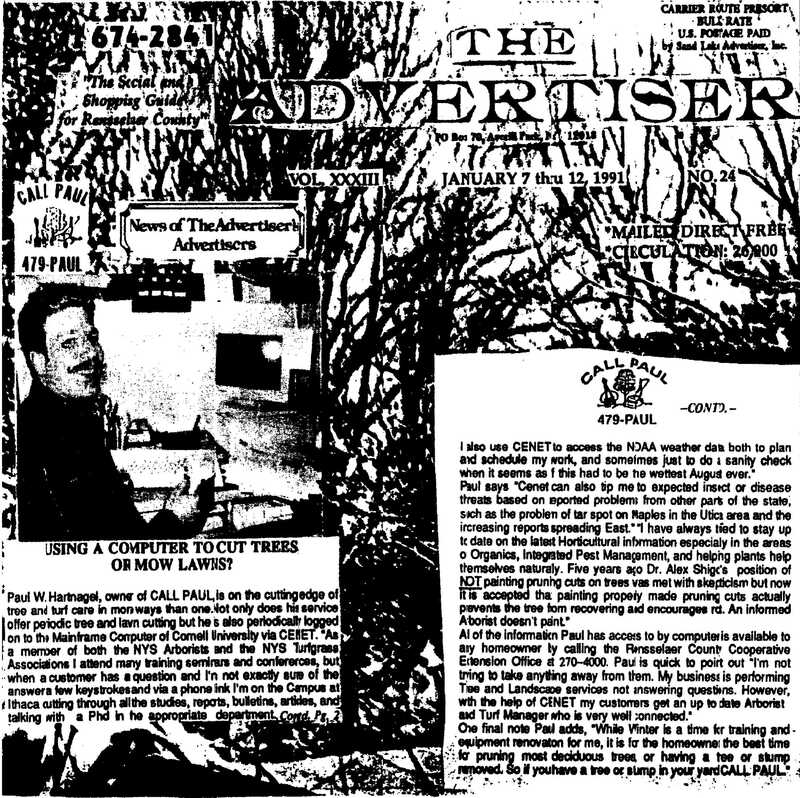 "As a member of both the NYS Arborists and the NYS Turfgrass Associations I attend many training seminars and conferences, but when a customer has a question and I'm not exactly sure of the answer a few keystrokes and via a phone link I'm on the Campus at Ithaca cutting through all the studies, reports, bulletins, articles, and talking with a PhD in the appropriate department. I also use CENET to access the NOAA weather data both to plan and schedule my work and sometimes just to do a sanity check when it seems as if this had to be the wettest August ever." Paul says "CENET can also tip me to expected insect or disease threats based on reported problems from other parts of the state, such as the problem of tar spot on Maples in the Utica area and the increasing reports spreading East." "I have always tried to stay up to date on the latest Horticultural information especially in the areas of Organics, Integrated Pest Management, and helping plants to help themselves naturally. Five years ago Dr. Alex Shigo's position of NOT painting pruning cuts on trees was met with skepticism but now it is accepted that painting properly made pruning cuts actually prevents the tree from recovering and encourages rot. An informed Arborist doesn't paint." All of the information Paul has access to by computer is available to any homeowner by calling the Rensselaer County Cooperative Extension Office at 270-4000. Paul is quick to point out "I'm not trying to take anything away from them. My business is performing Tree and Landscape services not answering questions. However, with the help of CENET my customers get an up to date Arborist and Turf Manager who is very well connected." One final note Paul adds, "While Winter is a time for training and equipment renovation for me, it is for the homeowner the best time for pruning most deciduous trees, or having a tree or stump removed. So if you have a tree or stump in your yard CALL PAUL."